From mixing on the air at HOT 97, to djing for brands such as Apple’s Beats by Dre and New York’s International Auto Show. 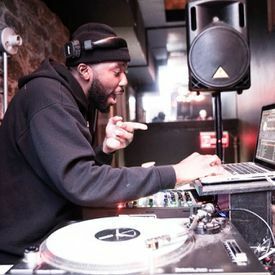 The New Jersey native started off as one of the station’s street team DJs, before quickly moving up the ranks and becoming a show producer for Funkmaster Flex, Lisa Evers, and DJ Bobby Trends. As an Open Format DJ, Michael Medium has performed at Billboard Hot 100, SOB’s, Webster Hall, Ace Hotel, Santos Party House, Club Sho, Phuket, Sons of Essex, Mercury Lounge, The Grayson, Public Assembly, Coco 66 and holds a monthly residency on the Jewel Yacht. Over the years he has shared the stage with the likes of Roc Nation’s Rapsody, Pro Era, ASAP Mob, Manolo Rose, Smoke DZA and Dougie F. You can catch Michael Medium on the DJ Camilo App breaking new R&B Artist, and on AM!